Hey everyone! 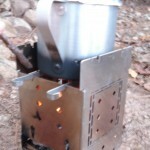 I’m Shadowalpha and today I’m going to talk about a wood stove called the Firebox from foldingfirebox.com. 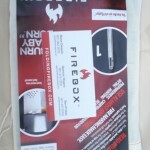 Ben Probst the creator of the Firebox sent a kit to me about a week ago. 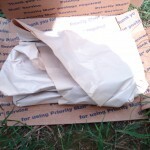 When the item arrived it was packaged in a small priority box. Upon opening the box I found packing paper neatly folded around the stove. 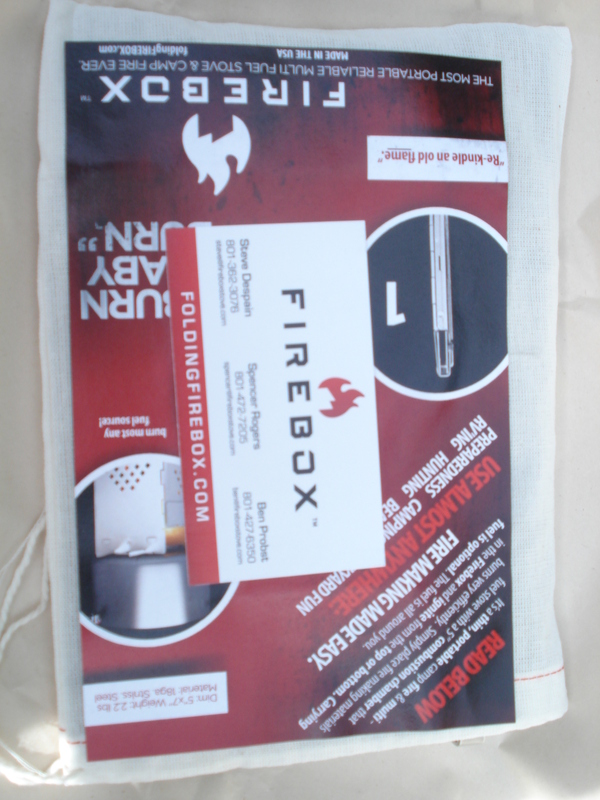 I unwrapped the paper to find the firebox in a canvas drawstring sack that fit around the firebox perfectly. Also included was an instruction sheet & business card. The instructions are on both sides of the paper with nicely designed graphics. Both stakes have a hook at one end. The stakes slide into two slots then the hooks clip to the top of the Firebox. Under the stakes the ash tray snaps to the Firebox keeping it all securely closed during transport. Coming out of the box the firebox design is very appealing! I proceeded to remove the stakes which slid out of the slots with no effort & pulled off the ash tray. 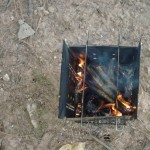 Once the stakes & tray were removed the firebox almost assembled itself! The Firebox is all one piece. I simply spread apart the walls and the bottom grate fell into place. The bottom grate locks into two small slots. Ben explains in his videos the two stakes can serve a few purposes. 1. they hold the unit together during transport. 2. use as pot stands when using smaller pots. 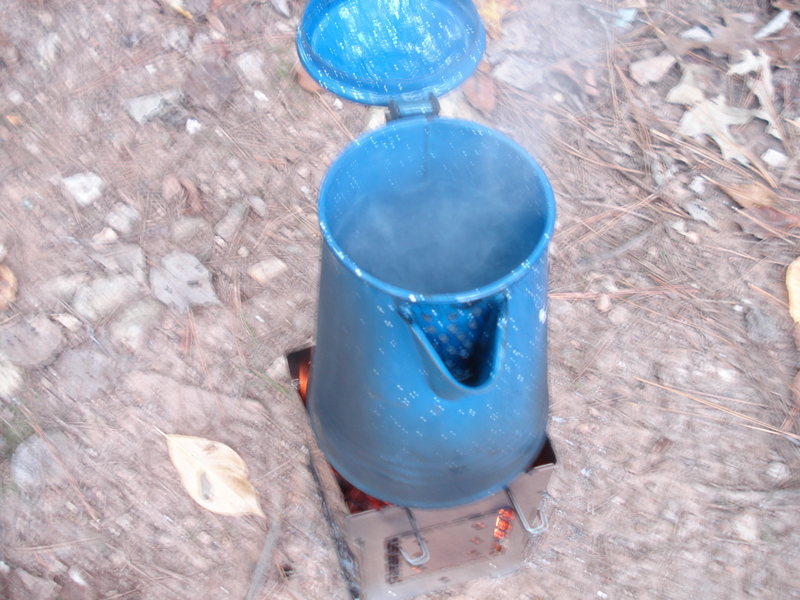 3. if using a larger pot/pan not needing the stakes as a pot stand — the stakes can be a tool to flip open/close side vent, move ash pan etc..
Let’s go outside to see what the Firebox can do. The first time I fired up this wood stove temps were mid 70s and a little breeze to none at all. 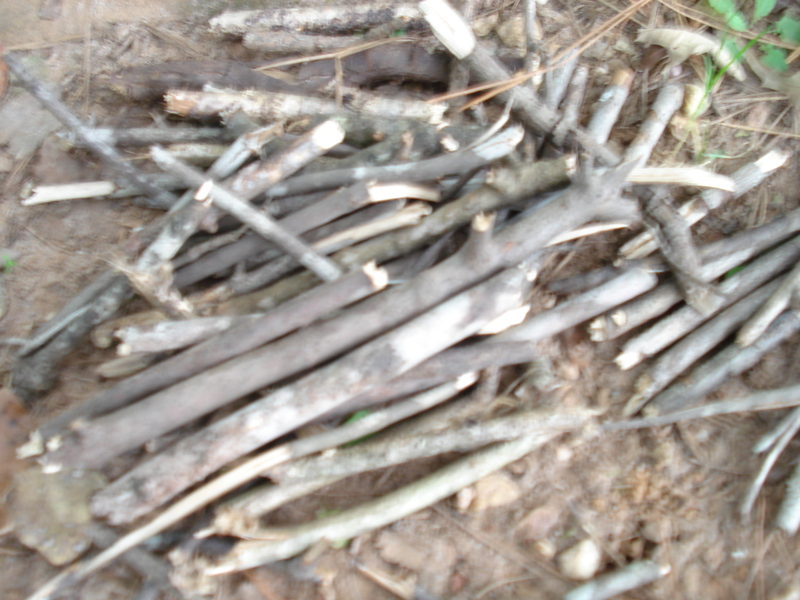 After collecting a bunch of sticks and breaking them down to the height of the Firebox — I loaded the inside of the Firebox with a bunch of sticks. 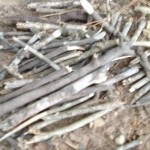 Then grabbed a few pieces of pine straw, twisted it together and placed it on top of the sticks. I lit up the pine straw, added a few more pieces of pine straw over that which started up the small sticks fairly easy. 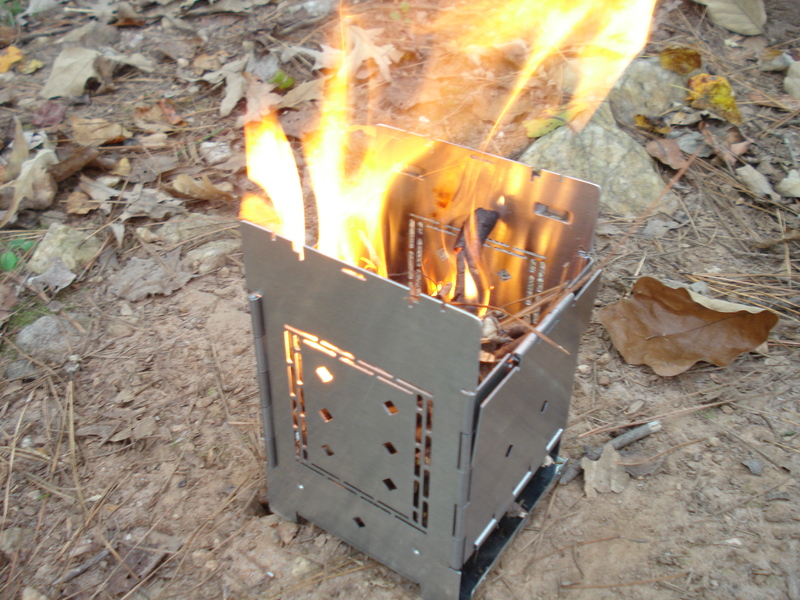 With some good kindling and dry sticks — plus with the good airflow the Firebox design offers – it was almost effortless to start a fire and keep it going. I had three cook pots with me. Snow Peak 600, Imusa 12cm and a enamel coffee pot. Within 5 or 6 minutes the water was boiling. 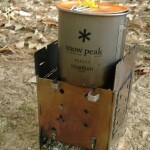 I proceeded to boil water with the Imusa pot & then the Snow Peak 600. Managing a fire with any of these pots was an easy task. 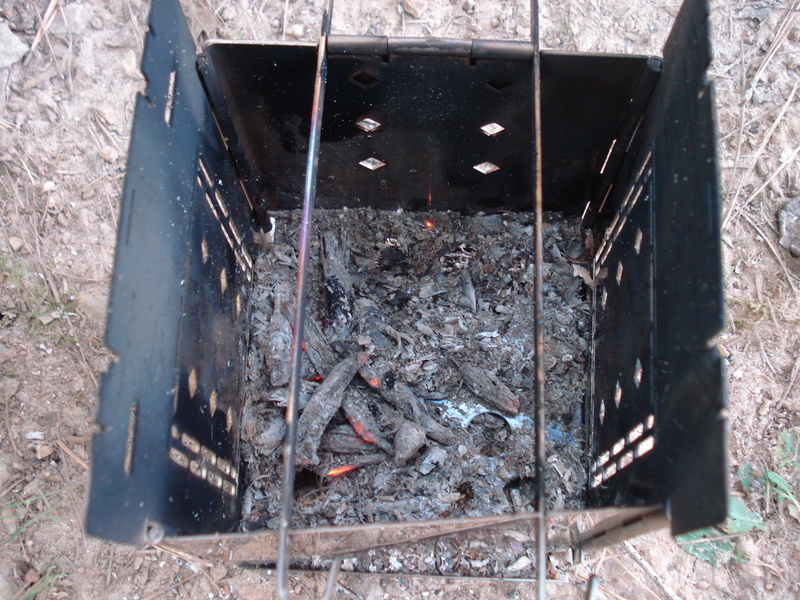 Finally I let it cool down and noticed all the wood was burned & only a fine ash was left in the bottom tray. 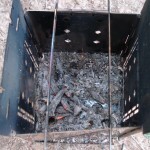 I dumped out the ash, removed the tray, turned it upside down to unlock the bottom grate & folded the Firebox walls together. Snapping the tray back on took me a few minutes for the first time. I think I was just a little gentle. With a good firm snap the tray went back into place. The flat stakes can slide into the slots from either end, however it is designed for the stakes to slide in from the top where the Firebox wording is in order for the hooks to grab the walls & keep the unit closed. ½” thick when folded & closed. – Easy to deploy. Its one piece design makes it very easy to open & close. No extra pieces to keep track of or loose. – Easy to transport. Using the two flat stakes with hooks, the unit stays tightly closed during transport. 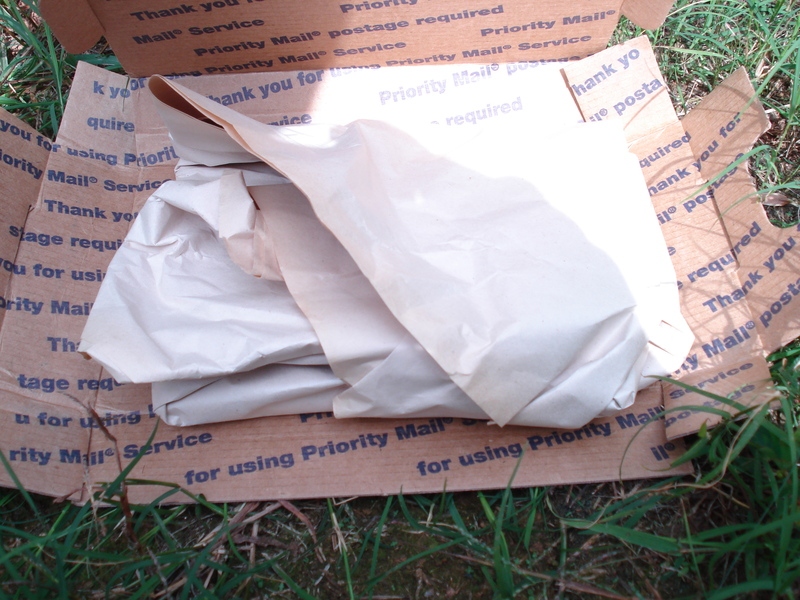 At a 1/2″ thick & its rectangle shape, when folded it does not use much space to store during transport. – Good ventilation. Easy to keep fire going. 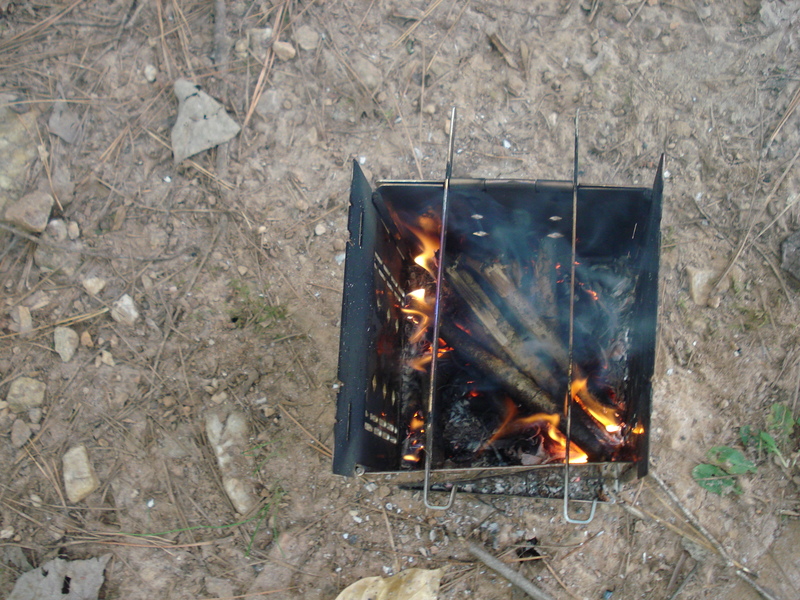 With a slight breeze the ventilation design kept the fire going as I fed little sticks into the firebox. Even after fire burnt down I was able to get flames going again with the small amount of hot ash that remained by adding some dry pine straw & more sticks. – Sturdy. 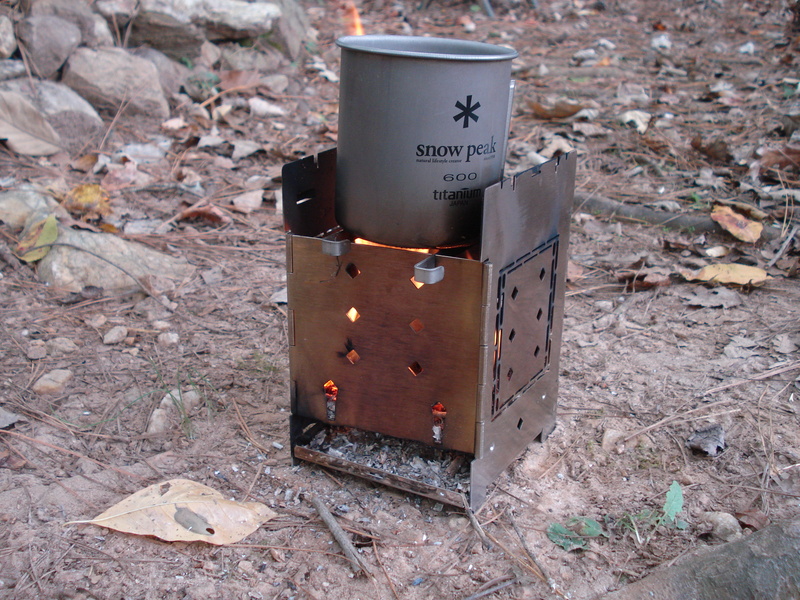 Its weight + height + width helps keep this stove in its place. With use of stakes for pot stand it holds the pot securely when cooking. 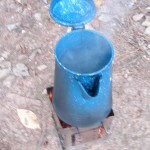 I moved the blue enamel pot around (which was holding almost 2 liters of water) with a stick and had no worries that the stove or pot would tip/fall. With its 18ga stainless steel construction I won’t be worried if I get a little rough with this wood stove. I can see using cast iron cookware on this with no problem. Or no worries when transporting if I lay some weight on top of it. 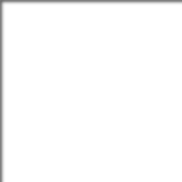 – Size. 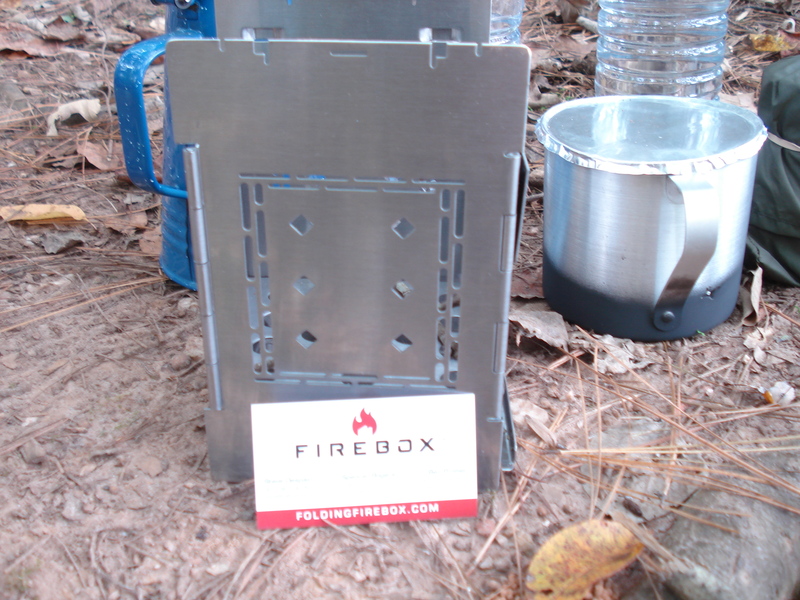 The size of the Firebox seems to allow various options to use different size pots, frying pans or even a grill. Height & width gives a good amount of space to pack it with plenty of wood to cook a meal – not having to continually feed it with wood. However, collect more wood than you think you might need – if breezy I can see the wood burning faster – so if you want to keep flames going — pack this bad boy with as much wood as you can fit! Then the width creates a good footprint to keep it sturdy from wobbling. Not having to worry if you are on a rocky surface. 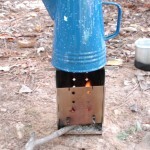 Fuel: Besides burning wood you can use an esbit tablet, sterno, charcoals or pellets. – Weight. For me the weight is the only downfall as a backpacker. 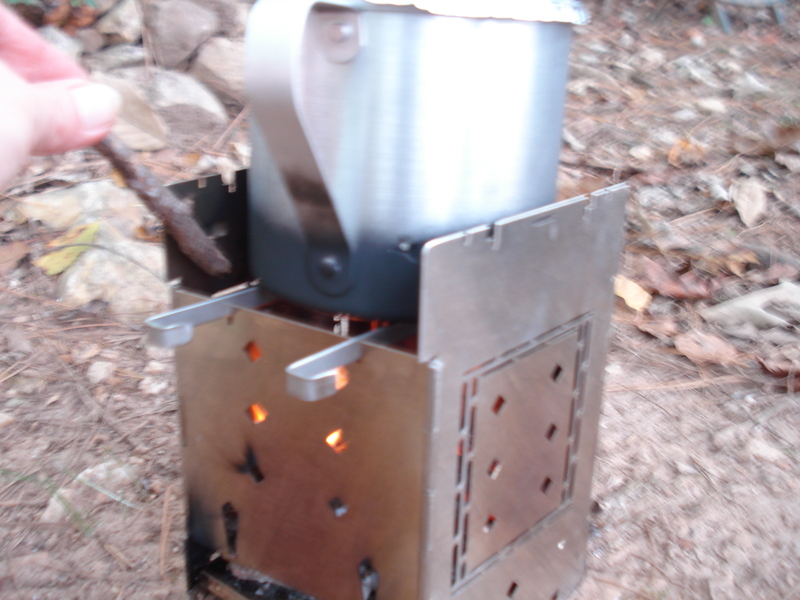 However, I will be using this stove for picnics/day trips at the lake or on my canoe. 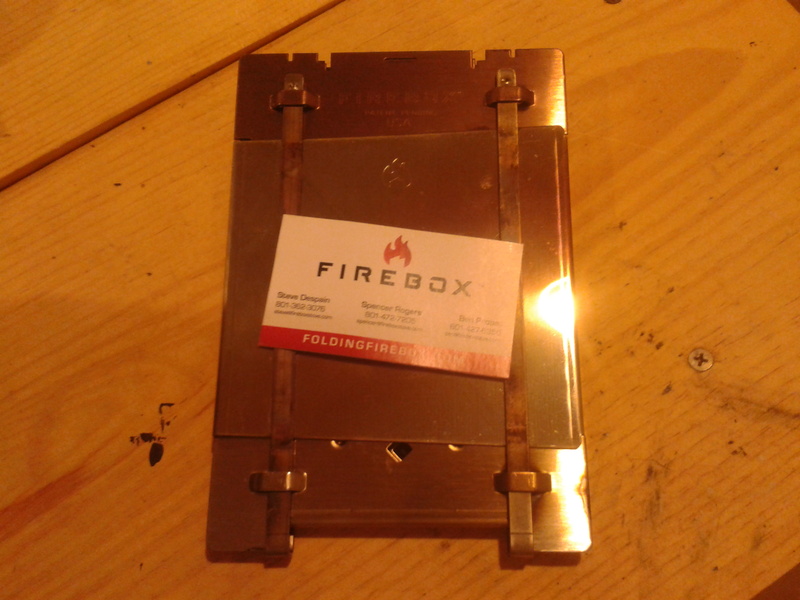 It is stored close to my emergency supplies – so in the event of a power outage the Firebox stove is a simple solution for cooking or boiling water. 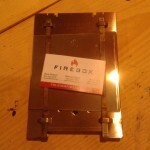 Price: Ben at foldingfirebox.com offers the basic kit for $59.99 which is what I show here in my pictures. He also offers an upgrade which includes a grill for $19.99 + a couple of combo kits. Ben has a bunch of great videos showing the Firebox being used with various fuels & its different configurations. 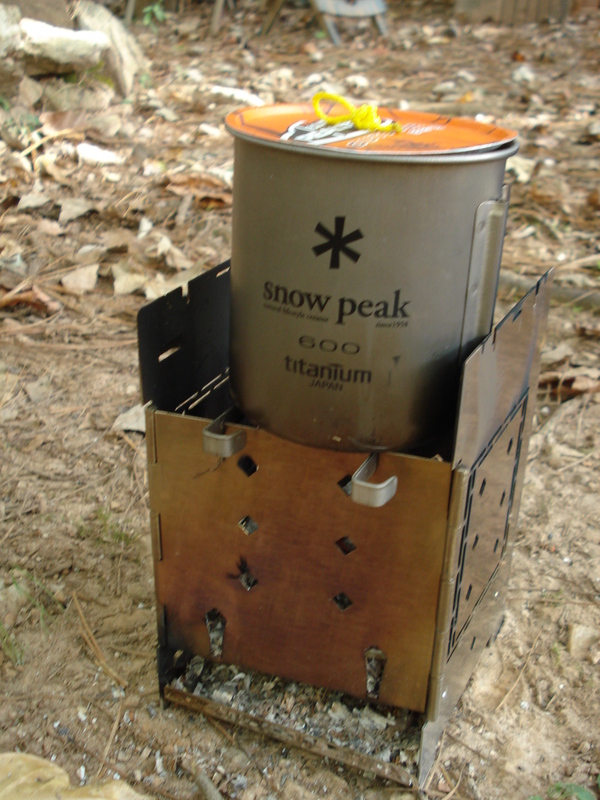 If you spend any time outdoors, want to add a solid stove to your BOB (bug out bag) with no worries to supply fuel. or as an addition to your in home emergency supplies. This would be great for Boy Scouts, hunters or if you want to have a small campfire where larger fires are not allowed or just simply want a smaller fire. Also a good source for heat when outdoors. Check out Ben’s Firebox stove. Nice summary Claire, thanks for sharing. 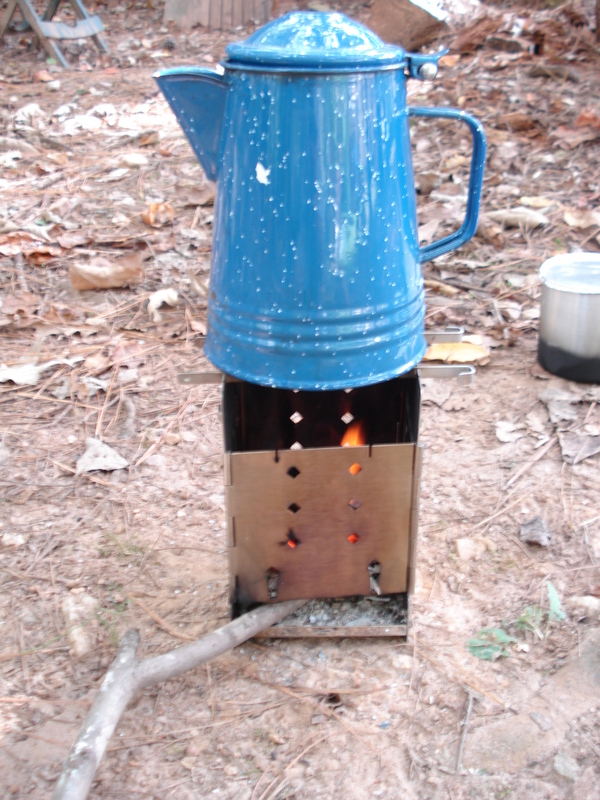 Don’t get me wrong though, it looks like it would be something fun for car camping, or maybe scout camps (if they are allowed to have stoves like these). Price does seem comparable. However – the design on this one seems different than most. Unless I’m missing something out there w/ these dimensions & design. IF all in one design is what you’re looking for – it would be nice to see this design made with Ti materials. I would be interested in what weight this particular design would be if made with Ti. Very nice review Claire! I think it’s a pretty cool product. Breaking down into a small, compact size and design makes it marketable but there are ones out there that are similar. I mostly camp in state parks and can easily bring in larger pieces of cooking equipment. 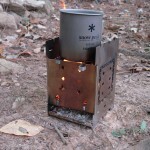 I would use this type of stove exclusively on overnight backpacking trips. The weight is a factor but since I already use a Snow Peak Baja Burner LI which weighs in at 6.1 lbs, this wouldn’t be much of a problem. Another issue I would have in New York State is that “open fire” cooking is not allowed on high peaks above 3500 feet in elevation. I’m not sure if using this would be considered “open fire”? It’s nice for the minimalist that is cooking for themselves or maybe one other. Thanks for the review! makes a very positive ecological and environmental statement. Even the no trace folks can little fault with it. 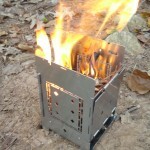 Would the Forest Service consider this an “open fire”? I plan on using it at State Parks, inside or on the provided fire ring. I purchased one to take with me on the road with my teardrop camper. I like the variety of options that the Firebox Stove offers for fuel. I have a propane stove and was a little scared about storing it and transporting it. 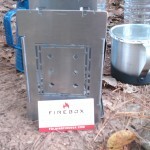 I am currently using the Firebox Stove with hardwood pellets for cooking. If other kindling is available at the camp site, then I can huddle near a warm fire that does not require much wood to keep going, until the conversation or the hot chocolate runs out.